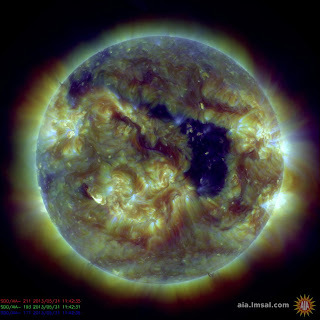 A Hole in the SunCredit: NASA/SDO/AIAFriday, June 7, 2013: An extensive coronal hole on the sun rotated towards the Earth during the week of May 28-31, 2013. The massive coronal area represents one of the largest in a year or more. Coronal holes produce strong solar wind gusts that carry solar particles out to the Earth’s magnetosphere and beyond. These holes appear darker in extreme ultraviolet light images (as in this photo, which combines three wavelengths of UV light) because less matter exists at the temperatures observed. The coronal hole may generate some auroral displays on Earth.